Mandores are an early version of the mandolin, said to have been first used by shepherds in Northern Spain from about 1500 or earlier. They were first mentioned in France in 1587, where they were fitted with four single strings or more. This example has six and may well have been tuned liked a lute. It is dated 1640 and signed by Boissart, an otherwise unknown but highly skilled maker. The back of the peg box is decorated with the head of Medusa, and the back of the body with the Judgement of Paris, a popular decorative theme which depicted the mythical beauty contest between the goddesses Juno, Minerva and Venus. Anthony Baines, Catalogue of Musical Instruments in the Victoria and Albert Museum: Part II: Non-Keyboard Instruments(London, 1978), p. 38. Purchased by the Museum for £140.0.0 in 1866. In the nineteenth century this instrument was thought by the Museum to date to ca.1570, but the dated inscription was noticed some time between 1966 and 1968, proving that the instrument was much later, having been made in 1640. Mandore, made by Boissart, Paris, 1640. 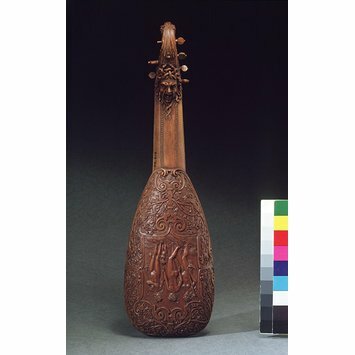 THIS musical instrument, somewhat resembling a lute in shape, is Italian and was made about the middle of the sixteenth century. The material is beechwood. Various instruments of this kind were in common use in Europe during the middle ages, especially in Italy; and were known by the names also of mandora, mandorina, and mandolino. The mandora had usually for each tone two strings, catgut and wire ; and there were eight pairs of them. The mandorina had four wire strings and resembled a diminutive lute, but its ﬁnger-board had metal frets, and the strings were fastened to little ivory pins at the end of the body instead of being looped through holes in the bridge. It differed from the pandurina chieﬂy in having a rounder and deeper body, and in having the tuning-pegs placed at the back of the head. The pandurina had a sort of scroll, with the tuning-pegs placed sideways as in the old English cither. The present example is very richly carved, well designed, and well executed. Within a large cartouche in the centre are the three goddesses Juno, Minerva, and Venus, grouped somewhat after the manner of the Graces and as if waiting for the judgment of Paris. After the decision they would probably not have been seen standing together so amicably; and we remember no other occasion on which the three are said to have met in the same kind of way. But the part of Paris is left out. An ornamental composition of scroll and strap work with foliage surrounds the group of goddesses, completely ﬁlling the whole body of the instrument. The stem is decorated with straight lines slightly designed, and terminates with a ﬁne and bold head of Medusa. There are seven tuning-pegs, of which six are shown in the illustration. The instrument measures nearly one foot ﬁve inches in length, and the width is four inches and a half. Bought for 140l. Victoria & Albert Museum: Fifty Masterpieces of Woodwork (London, 1955), no. 23. Once upon a time, relates a Greek myth, nuptials were celebrated on Mount Pelion of Peleus, King of the Myrmidons, and Thetis, a nymph of the sea. Almost all the pantheon were present. Eris alone, whose name meant strife, received no invitation. Into the rout of guests she therefore cast an apple of discord, fashioned of gold (that female hearts cannot despise) and inscribed (in one version) with the words DETVR PULCHRIORI. Ladies competing for this prize were at length reduced to a short-list of three: Hera, Athena, Aphrodite. Zeus, thus confronted with a difficult decision, passed the responsibility to Paris, a good-looking, young man then guarding on Mount Ida the ﬂocks of his father Priam. Hera offered him the wealth of Asia, and Athena victory in war. But Paris, gave the apple to Aphrodite, and received the promised hand of Helen of Troy. From the late fifteenth century, classical mythology, as it has been termed, provided poet and painter with an almost endless fund of opportunity, stock themes to later indifference, but fresh and fascinating stories then, such subjects were illustrated on every kind of domestic object that lent itself to such decoration: everyone was at home in antiquity. 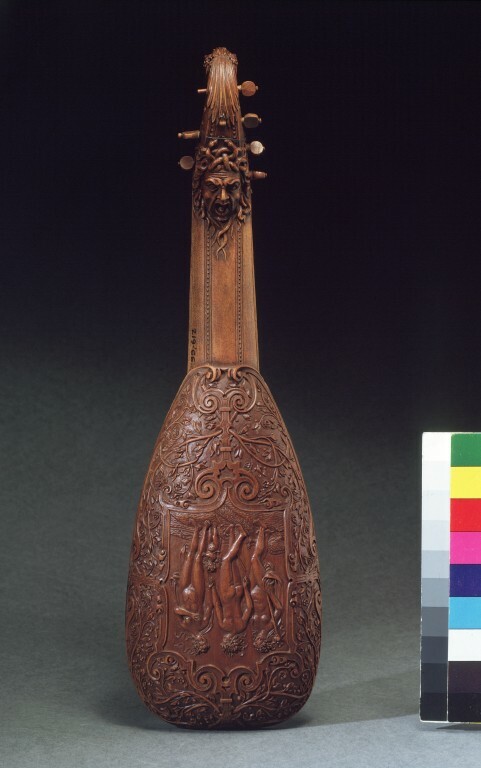 The ‘Judgement of Paris’ was of course popular with craftsmen in France. On this type of ‘pocket’ mandola, taking its renaissance name from the pastoral god Pan (pandurina), the choice without the chooser is gracefully carved in pearwood relief, within a surround of ‘mannerist' ornament dating about 1570. Hera bears her sceptre as Queen of Heaven, and is accompanied by the peacock that drew her car, the Junonia avis of Roman tradition. The winner, relegated to the right, displays her charms, with Eros beside her and his bow on the ground. Athena alone, honoured in the centre by the arts, is modestly averted from the gazer’s eye, and treads her spear beneath her Feet. The Pandurina was bought by the Museum in 1866. H. 16 ½ in., W. 4 ½ in. Casa d'Oro, No. 4 (18 Nov. 1966). Peter Thornton, Musical Instruments as Works of Art (H.M.S.O., London, 1968), figs. 17a and 17b. The mandore is one of a number of small, plucked string instruments of the lute family, first mentioned in France in 1587. This one is fitted with six strings and may have been tuned like a lute. The back is carved with a representation of the three classical goddesses Juno, Minerva and Venus, copied from a print dating from the 1580s.